My hopes that last Wednesday's run would be better than the night before were dashed as I fought to finish the short loop (8 km/5 mi.) at my running club. The first few miles I was stiff, a feeling not unknown 3 days after a marathon, but as I progressed the stiffness changed to pain as the muscle that I pulled during the last kilometer of said marathon started to throb. By the time I reached the trailhead my pace was reduced to a crawl and I winced at every step. No one needed to tell me that I had a serious problem. I took the rest of the week off from running, favoring rest and only venturing out Saturday for a 30 km cycling trip. On Sunday I tried another run, but my leg still did not feel right, so I quit after 5 km. On Monday I tried 8 km, it went better, only the last couple km were sore. Last night I met a friend and we headed out for a run, but after 8 km I again experienced pain in my left leg, so called it a day. I was planning on running a hilly 50 km race on Saturday, but after my run last night I know that I have no chance of finishing it, so will probably go on a long cycling trip instead. I think it's vital that I rest the leg until it recovers, otherwise I can forget about the rest of race season. I am trying to remain optimistic, so far cycling doesn't seem to be a problem. I have been a bit leery about going swimming, as my lower back is also an issue, but I know I need to take the plunge and see what happens. After several years of injury-free running and racing I guess my body is telling me to slow down. But I am still negotiating as to what that really means. I hope I can at least do a couple long distance events, the next couple weeks will be revealing. Last night I headed out for a short recovery run after work. My legs were quite stiff after running the hilly marathon on Sunday, so I welcomed the chance to loosen up. I headed out over the fieldways towards my running club trailhead, the countryside is blooming in its spring colors, beautiful! I let the landscape distract me from the discomfort in my legs, they were much stiffer than I ever remember after a marathon, perhaps the two hours of garden work the night before were not the best idea the day after a marathon - who knows. In any case I reduced my planned 9 km run to 6 and spent some extra time streching afterward, I hope tonight's run will be more pleasant. Thomas made a couple comments yesterday that I thought I would post about today. He mentioned that I found quite a scenic marathon to run this past weekend. This really is true, I look forward to running it again in the future. He also mentioned that my training seems to be going well, despite my back pain. If you have been following his blog you know he also hat a bout with lower back pain this year, but he managed to train through it. So far my back pain hasn't prevented me from running, but I have noticed that my recovery time from long runs and races is longer. I think this is mainly because my back hurts when I try to sleep and I end up tossing and turning much of the night. Sleep deprivation is not good when trying to train for long distance. Overall I feel my training is not going as well as last year. I've had to reduce my mileage by an average of about 30% due to a busy life and slower recovery times. I'm not feeling as confident about my training for the 100K event this year. Fortunately the 100K even in Biel on June 11th is supposed to be an easier course than the 100K in Ulm that I ran last year. If my lower back pain doesn't worsen in the next seven weeks I should be able to finish, although I probably will need a bit more time. I now have a 50K and marathon behind me for this year and I am getting a feel for how my race year will probably progress. My progression is kind of a good news - bad news scenario. The good news is that I have completed the first two events at reasonable finish times with 30% less training mileage than last year. The bad news is that I was at the doctor's last night concerning my morning back aches and he could do nothing more then confirm that I pinched a nerve and recommend a neurologist, my appointment is on May 14th. In the meantime I will continue to train with Andreas and Birgit for our 100K race in June. We are planning on running a 50K trail race on May 1st and another on May 13th, as I mentioned a couple posts back. 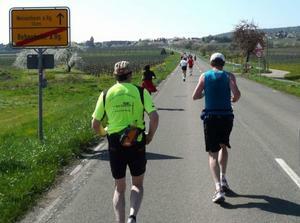 Both are low key events with limited participation and both offer lots of hills for our running pleasure. Life continues to be busy in other areas of our life, it's garden season for example, somehow my back didn't disagree to digging up the garden - much to my doctor's amazement. The weather has warmed up significantly, I spent some time last night getting my bicycle ready for cycling season - I would like to take a spin tonight, but rain is forecast. I will probably do a recovery run instead, or maybe swimming (or both). Bockenheim an der Weinstrasse is in the collective municipality of Bad Durkheim in the district of Rhineland-Palatinate in Germany. Bockenheim lies at the north end of the 85 km long German Wine Route, and has even adopted an epithet referring to its location there: an der Weinstrasse means "on the Wine Route" in German. Bockenheim is made up of two smaller towns called Grossbockenheim and Kleinbockenheim (gross means "great" and klein means "little"), which were merged in 1956. The two places arose from small settlements that themselves had grown out of Frankisch estates after the Franks took over the land about 500. In 1525, in the Palatine Peasants War, the Bockenheimer Cohort was formed, a rabble of peasants who joined the uprising. Until 1969, Bockenheim belonged to the now abolished district of Frankenthal. Since then it has been in what was then the newly formed district of Bad Durkheim. Bockenheim is an old winegrowing center in which the craft has been practiced for more than 1200 years. Even today, it is still the village's most important industry. Bockenheim's vineyards stretch for more than 1000 acres, along narrow and winding roads separating the surrounding villages. 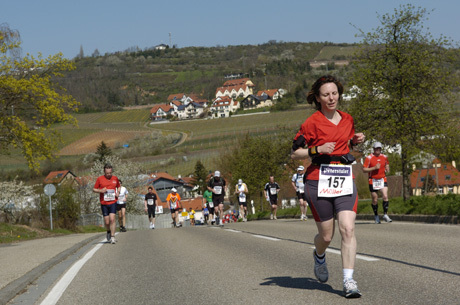 Every two years the peaceful villages are interrupted from their sleep by the thunder of thousands of feet, the running of the German Wine Route Marathon with Half-Marathon. 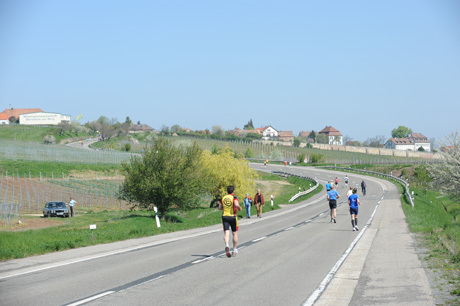 The event is slated as one of the most scenic road races in Germany. 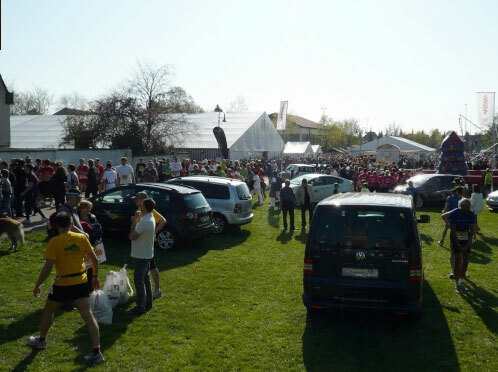 The race starts in Bockenheim, runs along the vineyards of the "Leiniger Land" district, into the district of Freinsheim, through beautiful and romantic wine villages leading to the halfway and turning point at the giant wine barrel in the spa town of Bad Durkheim. I first considered running the event when I heard that a couple friends from my running club were running the half-marathon. I committed myself to the race when friends Birgit and Andreas, who are running the 100 km race with me in June, signed up for the marathon. The marathon course is similar to what we expect to encounter during the 100 km race, so we were excited to be able to take part. On race morning I arrived at Andreas and Birgit's house (a husband and wife team :-), around 7:30 a.m. and they drove to Bockenheim. We found a parking space and walked to the start to collect our packets. The weather was sunny and warming quickly, as we returned to the car we discussed our race "outfits". I guess it was still around 13-15°C outside, but the sun was beaming brightly, we all decided on shorts and short-sleeve running shirts. As we lined up at the start we chatted with several people that we knew from other clubs and races. At some point Birgit and I lost site of Andreas, we would see him again first at the finish line. In any case Birgit and I had planned on running together, so we made sure WE didn't lose each other in the crowd of 3000 runners. 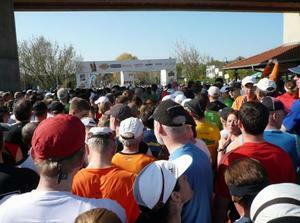 The starting pistol went off on time and we stood still until the mass began to move forward. Shortly before crossing the timing mat at the start we were able to start running slowly forward. The first Kilometer wound it's way through town, then climbed gradually up a small hill to about kilometer 3. From here we dropped down into a valley and climbed up the other side into the town of Asselheim, where I believe the first aid station was, and on to Gruenstadt. As we passed through the valley, I made a comment that we would see this valley again, namely the last 4 kilometers of the race, nothing like a climb to the finish! The course continued on more or less level, dropping into another valley around kilometer 8 and remaining more or less flat as we ran through the town of Sausenheim. 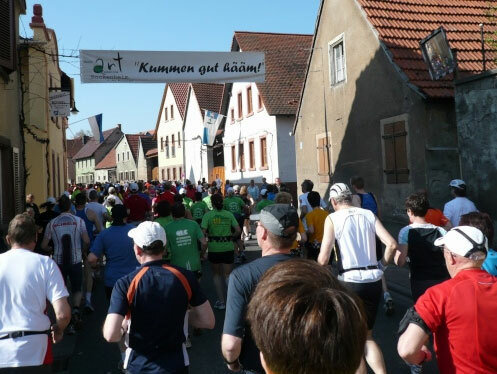 As we passed the second aid station around kilometer 10 we began a serious of climbs that would bring us to the highest point in the race at Weisenheim am Berg (am Berg is literally "on the mountain"), around kilometer 14. As this was a training run for Birgit and I, we chose to walk some of the more challenging climbs, just as we will when we run the 100K race in June. As we left Weisenheim am Berg we descended down a beautiful panoramic road into Leistadt, but quickly climbed out the other side. We both remarked that our legs were already feeling the affect of the asphalt roads and hills, and they again were pounded beginning at kilometer 16 as we descended to the lowest elevation point of the race. 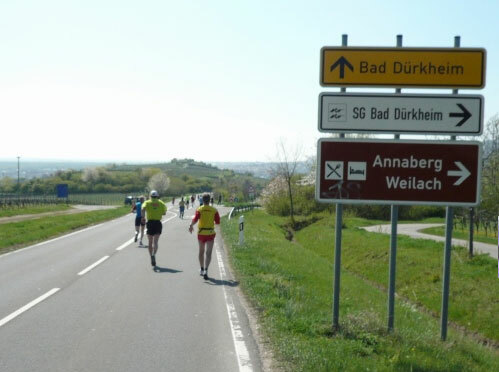 At least this time we were able to continue to run on a relatively flat part of the couse around Bad Durkheim until we again climbed to the town of Ungstein at kilometer 26. 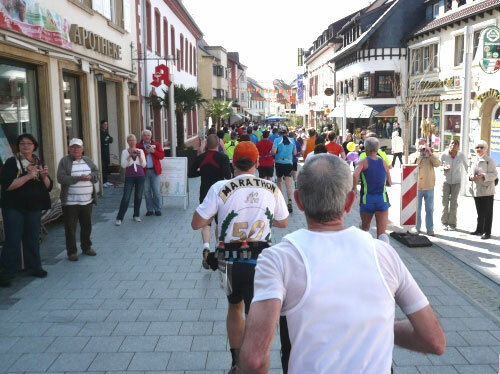 From Ungstein we again climbed, first to Kallstadt then to Hexheim am Berg at around kilometer 30. This serious of climbs were the second most challenging of the day, not the highest or steepest, but surely the hottest. We were both caked with sweat and salt, the temperature was probably only 22-23°C, but the sun was hot and we were running on asphalt. I can usually handle the heat pretty well, but Birgit was not feeling her best. We kept the pace down and made sure we drank at each aid station. After leaving Herzheim am Berg we descended slightly into Dackenheim, then ran over a series of rolling hills that traversed through vineyards to Kirchheim and eventually returned us to Grunestadt, with around 5 kilometers to go. By this time we were both hot, were complaining of a bit of stomach upset from the combination of fluids offered at the aid stations and the heat, and eager to call it a day. We attacked the pace as best we could, trying to increase the pace as we dropped into the final valley that would lead us to the finish line. We managed to run most of the way out of the valley and as we wound our way towards the finish line were even able to pick up the pace. As the finish line came into view we broke into a lame man's rendition of a sprint and crossed in 4:39:45 (chip time), mission accomplished! Tomorrow I'm heading to Bad Dirkheim in the Rheinland-Pflaz with friends Birgit and her husband Andreas to run the German Wine Street Marathon (Deutsche Weinstrassemarathon). We are all training for the 100K race in Biel, Switzerland held on June 11, and need a long hilly training run - this marathon is similar to Biel with around 1600 feet of elevation gain/loss. Back Pain, Leg Numbness/Pain. Is it Sciatica? "...Sciatica is pain that usually starts in the low back and then travels down the leg. It's caused by something, perhaps a herniated disc, pressing on your sciatic nerve in your lumbar spine." This week the pinched nerve in my back continued to irritate me off and on, usually when I first woke up and when I walked to the train station mornings. During my walk to the train station my right leg would go numb and become painful by the time I reached the station. Once I sat in the train the pain in the leg and back disappeared. Surprisingly I have no pain when I run, so have continued to do so. On Wednesday night I ran with my running club, settling in with the mid-pack group. We started out nice and slow, but ended up picking up the pace considerable (7:40/mi.) by the end of the run. There was no evidence of back pain until afterward when I was standing around talking with friends...funny. On Thursday I ran with RB and our friend Uli, my right leg was a bit stiff, but I though maybe it was just the faster pace from the night before. I went swimming on Friday and my back/leg felt fine. On Saturday morning I was up early and on the hilly trails in Weingarten by 7:00 a.m. I completed 31 km (19 mi.) with lots of elevation gain and loss. Towards the end my right knee became a bit uncomfortable, but I think it had more to do with the elevation than my back. On Sunday I picked up RB and we ran the Stutensee Stadtlauf (Town Run) 10K race. I let RB set the pace and we finished in 55:27, not bad for her for this time of year. The weather was cool (40°F) and sunny before the race, but as we lined up the first rain drops fell. By the time we finished we experience sun, wind, hail and lots of rain. RB was less than happy, but that's the way it goes sometimes. After changing we joined friends from our running club for cake and coffee at a nearby shop. It was a nice morning, I hope we can repeat it often this year. Last night (Tuesday) I joined Birgit for a run at the local research center. When I came home from work right before this my back was acting up again, my leg had shooting pain as I walked home from the train station. When I got I home I sat on the couch and propped my legs up, after a few minutes the pain was gone like it was never there. When I joined Birgit my leg and back were fine, we ran around 7.5 miles at an easy pace, no problem. I want to go to the doctor anyway, the pain in the back/leg is infrequent, but I want to know what is causing it so it doesn't get worse. Until then I am trying to not over do it with my training and other activities that require lifting or lot of movement. I want to run again tonight, but then want to take 2-3 training days off to see if it helps. Another busy week come and gone, this time with Easter sandwiched between my posts. My wife and I spent the weekend in on the road for the most part, visiting, eating way too much and trying not to go nuts. I squeezed in a 30 km (18.6 mi.) 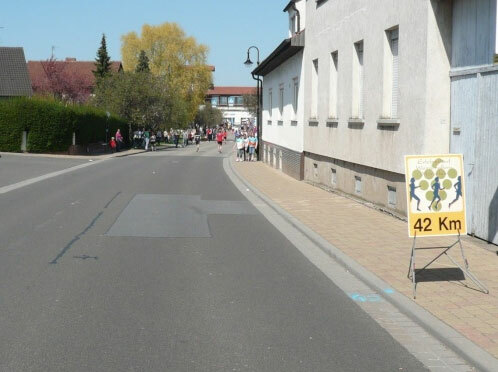 long run on Friday afternoon (Good Friday is a holiday in Germany), with lots (and lots) of smaller hills that added up to a great workout for my quads (read I need a chair). On Sunday I snuck out for another 10 miles and on Easter Monday (also a holiday) I took a spin on my bicycle, covering about 25 km, a nice warm-up for the season. My training for the 100K race in Biel Switzerland in June is more or less on schedule. I have been doing less running this year compared to last year, averaging around 75 km (46 mi.) a week, compared to around 100 km (60 mi.) a week last year at this time. Life is way too busy. I still haven't figured out when I am going to train for my sprint triathlon in July. Birgit from my running club, who is running the 100K race with me, sent me an e-mail today with a link to a new race in September in our area. She asked what I thought about it, in other words if I thought we could finish. The race is much more challenging than anything we have done in our running lives, so I think we need to talk about it on our next run together. 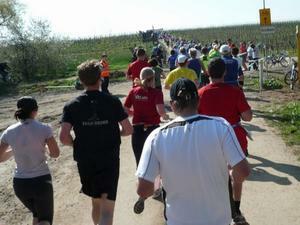 We can't wait too long though, it's an invitation only race and the 25 slots are filling fast. I'll keep the details a secret for now, but you are allowed to let your imaginations run.